The Bombardier Q400 Cockpit is one of the most advanced in the regional turboprop category. Out of all the Bombardier Q-Series turboprops the Bombardier Q400 Cockpit is the most advanced and up-to-date. Inside the Bombardier Q400 Flight Deck is the Bombardier Q400 avionics, which consists of 5 LCD panel displays. The Bombardier Q400 Cockpit's avionics displays have 2 primary flight displays and 3 multi-functions displays. Yokes with columns attached to the floor control the elevators and ailerons in the Bombardier Q400 Flight Deck. On the Bombardier Q400 yokes are controls for trimming the elevator, autopilot disconnect and push-to-talk PTT switch for the radios. Also in the Bombardier Q400 cockpit is a observer seat or jump seat located right in front of the door. The center control column in the Bombardier Q400 cockpit houses the engine throttles, flap controls, flight management system (FMS) and other controls. On the left side of the Bombardier Q400 Cockpit is the nose wheel steering control that steers the front landing gear on the ground. The Avionics system inside the Q400 turboprop's cockpit is powered by Thales. Thales is one of the primary manufactures of the avionics system for the Q400. 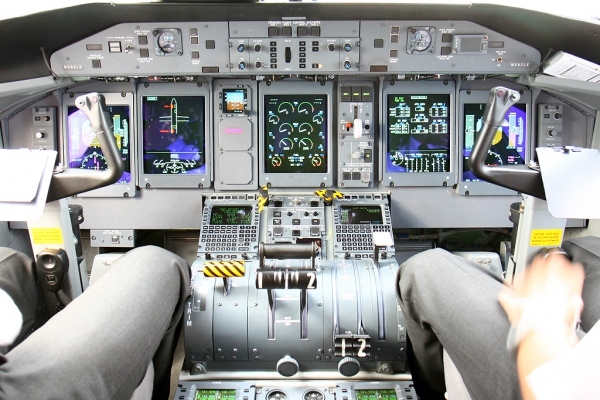 Bombardier selected Thales Group in 1995 to provide the avionics systems for the Q400 flight deck. ACSS, an L-3 Communications & Thales company, is also providing some of the newer upgraded systems for the Q400. More information on the Q400 avionics systems can be found on our Q400 avionics page (coming soon). To learn more about the regional turboprop visit the other pages about the Q400 on the site. Above Bombardier Q400 Cockpit - Flight Deck photo by Konstantin von Wedelstaedt on Wikimedia Commons. Bombardier Q400 Cockpit Photo (only) released under the GNU Free Documentation License, Version 1.2.